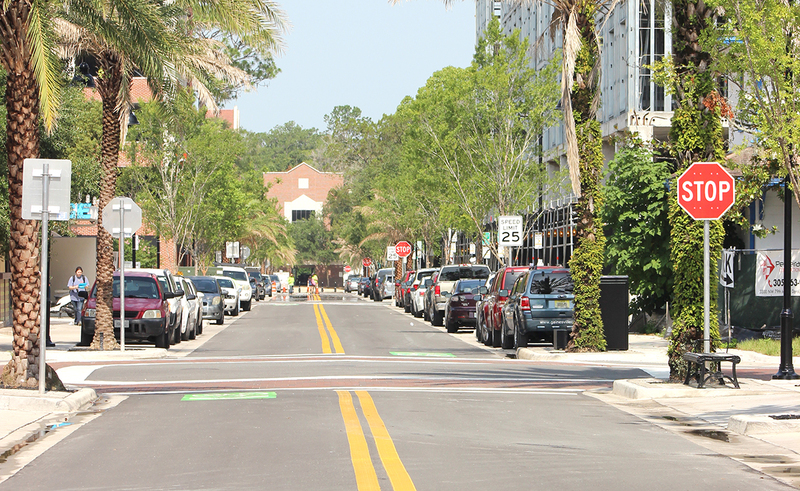 This past week, Gainesville CRA unveiled its transformation of NW 1st Avenue Streetscape Project. NW 1st Avenue, located between NW 16th Street and NW 20th Street, is one block north of University Avenue, across the street from the University of Florida and the Ben Hill Griffin Stadium. It is the main economic and social hub for Midtown Gainesville. This segment of NW 1st Avenue is an approximately 2,000-foot long, 50-foot wide right-of-way, two-lane corridor, housing multiple users with competing needs, limited resources and abundant blight. Properties located on the south side of the street primarily front University Avenue and use NW 1st Avenue as a service alley, where utility, waste, delivery, and parking needs must be met. Businesses and residential users on the north side of the street, however, use NW 1st Avenue as their front door, and look for an attractive and functional street. This Streetscape civil engineering project created a safer, more walkable environment in Gainesville’s Midtown #midtownGNV by allowing for overhead utilities to be placed underground; adding more lighting, parking, and walking space. Bricked intersections and consistent LED lighting have been implemented for better visibility, both for pedestrians and drivers. Street car parking rose from 38 spots to 55, scooter parking spots rose from 0 to 110, and bike racks rose from 0 to 80 spots. A continuous sidewalk of 2,000 linear feet with seven feet of walking space has also been materialized lined with 50 new trees to provide shade for pedestrians. Now, residents, customers, visitors, and business owners are afforded more space to park and have an inviting and safe walkable environment. Our Gainesville CHW office provided civil engineering, transportation engineering, land surveyor, and construction administration services to the Gainesville CRA. We are proud to have provided professional consulting services for such a profound change that encourages to people to visit www.MoreinMidtown.com.